Download "SRL Networks Presents The Bilinda Butchers" on The Skunk Radio Live Record Store. 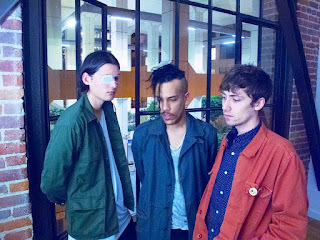 The Bilinda Butchers are a Dream Pop group based in San Francisco, USA who take their name from My Bloody Valentine guitarist and early inspiration, Bilinda Butcher. The group experiments with genre-blending and dramatic themes to create sprawling, cinematic music. Michal is the singer and rhythm guitar player for the bbs. He also works on all of the production with Lukas. He was born in the US to Polish immigrants and currently lives in San Francisco. When he isn't working himself to death, he enjoys studying Japanese, cooking, and listening to music while walking through the city. Adam is the lead guitar player for the BBS. He sings on a few songs too. When he isn't making music with Michal and Lukas, he enjoys reading, taking long walks through cities and drinking. Lukas is the DJ and producer for the BBS. He also plays bass! He was born in Seattle, Washington by parents who emigrated from Austria and Poland. He loves rave music and '90s bands as well as reading about cars he will never drive. Listen out for Lovers Suicide and other amazing Dream Pop songs by The Bilinda Butchers on Skunk Radio Live.